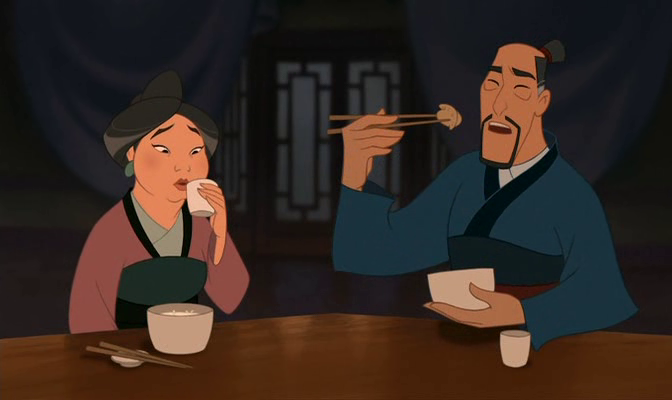 Dumplings are shown twice in Mulan. The first is when Mulan and her family are sitting down for dinner. Her dad pops one in his mouth. Later on, after the avalanche, Mushy roasts one over the fire. You only need one recipe for them, how you cook them is up to you. Start a day before you want to cook. Brine the pork by mixing the salt, sugar and 4 cups of water until the salt and sugar dissolve. Put the pork belly in a large sealing bag and pour in the brine. Make sure there is no air in the bag. Chill in the fridge for at least 12 hours. Pour in the chicken broth and 1/2 cup of water. Cover with foil. Make sure it is tight. Roast for about 2.5 hours. Let it cool and then chop it up finely. add the cabbage and blanch until just wilted. Place grated ginger in a small bowl or cup, cover the ginger with water and let it steep for a few minutes. Chop scallions into short thin pieces. Use all the scallion. Throw in with the pork. Place the ginger and water in a strainer over the pork bowl and press down so all the ginger juice comes out. Discard the rest of the ginger. Add the soy sauce, sesame oil, wine, and pepper. Place the flour and salt in a large bowl. Slowly add water and mix with your hands. Knead the mixture until it forms a soft dough. Place the dough on a lightly floured counter and knead until very smooth. Divide dough into 50 small, equal pieces. Flatten each piece with your hand to form a thin, round pancake, approximately 3 inches in diameter. The center should be slightly thicker than the edges. Wet your finger with water and run it across one edge of the wrapper. Fold the other side over and press against the wet side of the wrapper to create a seal. Pinch it together to create a few pleats. Make sure it is sealed. You might need to add some more water. Bring a medium bowl of water to a boil. Boil for 3-5 minutes. 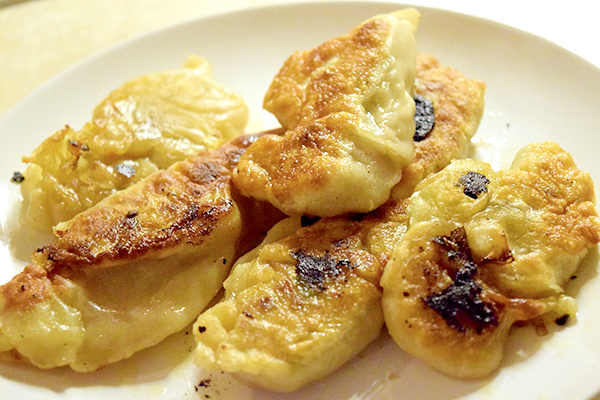 The dumplings should rise to the top when they're done. 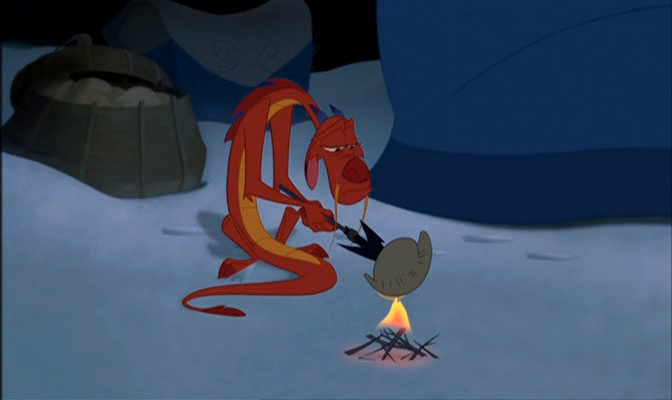 and then Mushu brings a bowl to her in the morning that’s happy to see her! So here’s how to make it. 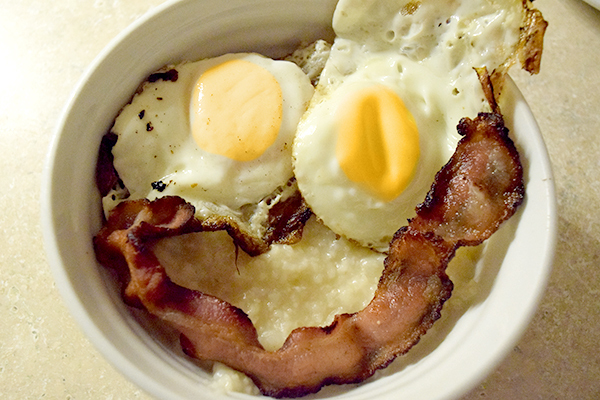 I recommend eating it with sunny-side up eggs mixed into it. It was yummy. In a large pot, bring chicken breast and water to a boil. Add wine, ginger, scallions and salt. Once the chicken is cool, tear into shreds. Pour stock through a sieve and discard the large pieces. You should have about 8 cups left. If you have less, add water, if you have more up the cooking time once you add rice. Return the stock to the pot, add the rice and bring to a boil. Reduce heat to low, cover the pot leaving a vent, and simmer for 1.75 hrs until the rice is the constancy of porridge. Will it Make you Swift as a Coursing River, with all the Force of a Great Typhoon and all the Strength of a Raging Fire or Mysterious Like the Dark Side of the MOOOOOOON? The dumplings were really good. I LOVED the filling. Making the wrappers was probably more work than it’s worth. I recommend just going and buying pre-made wrappers. 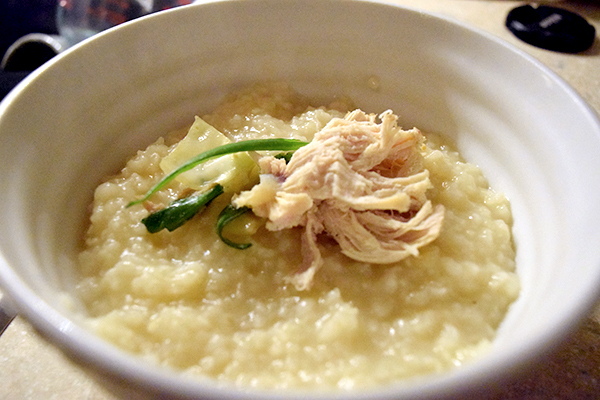 The congee was surprisingly good. I didn’t think I would really like it, but I might make it regularly for breakfast now.